Cozy, colorful, warm, elegant, and fun, this surprising vacation rental in Guanacaste packs a lot of punch in its eclectic living spaces, allowing guests to experience Las Catalinas in a fun, different way. Cozy in the shade, yet just a couple of minutes from the beach, this lively Costa Rican beach apartment offers old world comfort and tropical delights, with a few playful notes and a mix of styles that make it one of a kind. 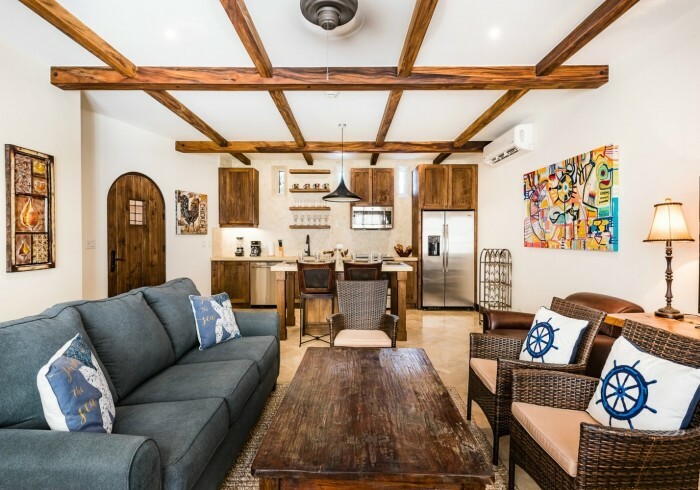 This Las Catalinas tropical home offers a spacious common area in which kitchen, dining, and sitting rooms are integrated to make it easy for the loving couple or family to spend time together. In it, rich wood, leather, and glassware happily coexist with modern paintings and sea motifs, while a roofed terrace offers space for creative outlets, relaxation or work. The stylish master suite with a Queen bed hints at passion and character, with crimson and golden tones highlighting the refined bed coverings with a phoenix theme. They are framed by a couple of rustic tables and lamps, and complemented by a porthole-like mirror that gives it all a unique maritime feel. A hidden treasure in gorgeous, centrally located Plaza Carlota, this Costa Rican beach rental has attitude to spare and is ideally suited for the refined, unconventional traveler. Up to 4 guests can be accommodated in this Las Catalinas flat, where children are welcome.